A new field guide for a new breed of bird watcher! From the iconic Laughing Kookaburrra to the rare and elusive Night Parrot, Australia’s birdlife is diverse and spectacular. And bird watching is a popular and growing past time with Australian bird-watchers travelling far and wide to the most remote parts of the continent, adding dozens of new species to the Australian bird list. The Australian Bird Guide from CSIRO Publishing is the most up-to-date and comprehensive field guide of Australian birds ever seen, featuring over 4700 specially commissioned paintings of more than 900 species. But do we really need another bird guide? It is not just the addition of new species that makes this field guide necessary and eagerly awaited, but also the era in which it is produced. The age of citizen science. Bird watchers are now using new technology to communicate and discuss their observations via social media, which has provided a rapid mechanism for feedback. Web-based image storage and sharing sites and even email have meant that images are readily accessible and shared. “By following on-line bird forums for the last decade, we developed a detailed understanding of the bird groups that regularly caused confusion for birders, and paid particular attention to demystifying those groups in this guide” explains author Peter Menkhorst. The availability of digital cameras has produced a flood of useful images from which these species can be accurately illustrated. Somewhat perversely, given this fairly recent upsurge in the quality and availability of bird photographs, it is still artwork that is key. The Australian Bird Guide features over 4700 specially commissioned detailed paintings. This stunning artwork provides the fine detail required to identify difficult groups and distinctive plumages that photographs just can’t deliver. This, combined with the comprehensive species accounts written by a dedicated team of ornithologists, ensures identification details, distribution and status are current and accurate. 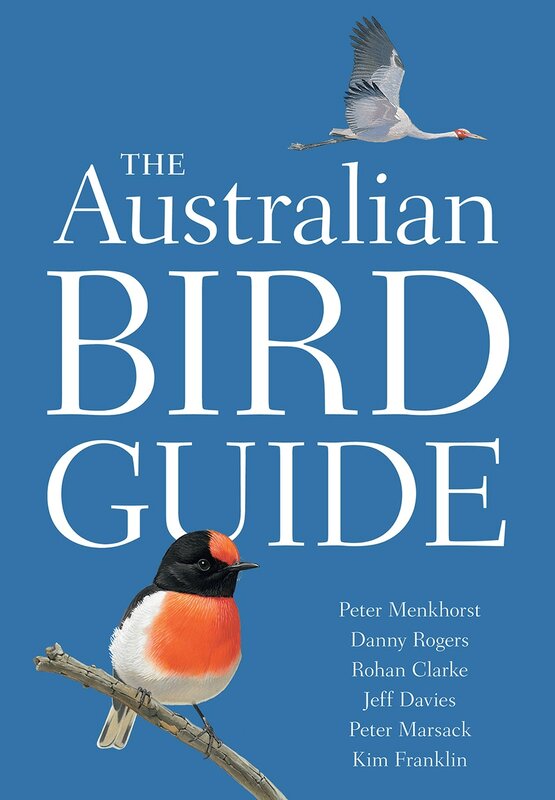 More than ten years in the making, The Australian Bird Guide sets a new standard in field guides, providing an indispensable reference for all birders and naturalists looking to explore Australia’s magnificent and unique birdlife. About the Authors: Peter Menkhorst has more than 35 years’ experience in the survey and management of Australian mammals and birds and is the author of Field Guide to the Mammals of Australia. Danny Rogers is principal ecologist with the Department of Environment, Water & Natural Resources in SA. Rohan Clarke is a lecturer in the School of Biological Sciences at Monash University. Jeff Davies is an Australian artist, focussing on portraits of Australian birds and their environments. Peter Marsack is an award-winning freelance artist based in Canberra. Kim Franklin is an Australian-based freelance artist who has exhibited worldwide.